The theme of the gamejam was "What is home for you?" so we thought a lot and saw that we all feel that wolves have a home wherever they go, so we used them to make this game. 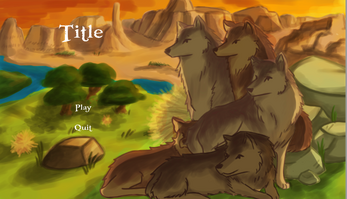 In the game you control a pack of wolves that must hunt, rest, hug and hunt one more time to mantain their family alive. *Sleep (Recover sleeping bar) pressing E.
*Press escape to pause the game. *Press WASD or Directional arrows to move. and well, i did all programming lol.